Want to enjoy delicious foods, more energy, a healthier lifestyle, and lose weight? Skinny Chef gives you the solutions you need to succeed. People crave rich tasting, well prepared meals, and that’s why restaurant food is so tempting. Using the right recipes and the right techniques determines not only how amazing your food can taste, but also how you can enjoy them without putting on the pounds and feeling more energized at the same time. Healthy AND Delicious? That’s Right. Wish you could ditch the diets forever? Nobody likes yo-yoing weight and hard-to-follow diet routines, so it’s the perfect time to trust a skinny chef for decadent tasting dishes that can be enjoyed year-round and guilt-free. Making delicious food healthier, and healthy foods delicious is only the first step. Once you’re hooked on mouth-watering new favorites, you’ll appreciate cooking fast and easy recipes at home and making other small tweaks that create a more vibrant, balanced lifestyle. So go ahead… sign up for free updates today and join Skinny Chef Jennifer Iserloh to explore the fascinating insights, recipe ideas, and healthy cooking tips that a professionally-trained chef has to offer. If you’re really curious, we’ll tell you a bit about the gal who started this whole thing. Remember, you asked for it. 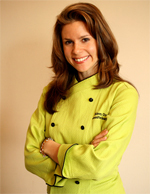 Skinny Chef was launched in April 2003 by Jennifer Iserloh. Jennifer is CEO of Skinny Chef Culinary Ventures, a passionate advocate for delicious and amazing foods, and a recognized healthy cooking expert. As a trained chef, author and health expert, Jennifer has created thousands of delicious recipes, articles, and blogs posts for TV, print and web publications including The Today Show, Living Well With Montel, SELF, Prevention, Parents, First for Women, AOL KitchenDaily, and LiveStrong. In addition to her own books, Secrets of a Skinny Chef (Rodale, 2010), Yoga Body Diet (Rodale, 2010) and Active Calorie Diet (2011), she was also the recipe developer for Jessica Seinfeld’s Double Delicious (2010) and Deceptively Delicious (2007), as well as Joy Bauer’s Food Cures (2007). With Skinny Chef, Jennifer’s mission is to show families that healthy cooking can be fresh, fun and flavorful – including techniques from professional kitchens to empower people to take on a bigger role in their own health while enjoying life more. LiveStrong.com got 350,000 people to watch Jennifer’s Food Courting videos. Have you subscribed yet to Jennifer’s weekly tips and recipes?